One of the many pluses when it comes to reviewing for MusicWeb International is the opportunity to hear things you'd would otherwise be unlikely to come across. Add to this that you get the opportunity to post your review of something which would in general be ignored elsewhere. As with so many examples of folk songs from 'Eastern Europe', in all but two cases the subjects concern love either for specific girls or for girls personified by flowers or, in one case, a snowflake. One of the two remaining songs deals with homesickness (Mallëngjimi), perhaps caused by displacement due to the Kosovan war. It was this war that took the life of the dedicatee of the a capella rendition here of Ma fal ať buzëqeshje (Give that smile to me), singer Esat Bicurri, who popularised this song. The other song not dealing with love is the final one which concerns the jails of Shkodra that were filled to capacity under the dreaded regimes of Enver Hoxha (1944-85) and Mehmet Shehu and Ramiz Alia (1985-90). Normally I dislike hearing folk songs or things like West Side Story sung by opera singers since the voice is wrong for the repertoire. Here the bell-like clarity of Flaka Goranci simply brings out the beauty of the songs which are sung in a way more usually found in German lieder - something she has studied. It works. It is interesting to hear that there is a sound in these Albanian songs that is also common in Jewish music. This is particularly so with Unë ty moj të kam dashte ije (I Loved You) Mallëngjimi (Homesick) and O zambak, zambaku i bardhë (Oh, Lily, white Lily). I thoroughly enjoyed my introduction to the music of this little known corner of Europe. It is only now becoming better understood and doubtless more awaits discovery. 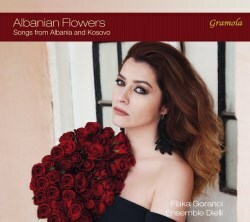 The three musicians accompanying Flaka Goranci serve her wonderfully well and are an international trio coming as they do from Albania, Kosovo and Roumania. I hope this disc finds favour in a crowded music market. I have just one cautionary word and one gripe for Gramola who produced this record: always have a translator making the translation into their own language if you want the translation not to sound stilted. It should be noted that at just over 40 minutes the CD is too short and really should have included quite a few more songs.